For some reason I have a strong desire for the colour green lately. In order to meet this need I have bought green pillows, ferns and succulents to add extra green to our home. Perhaps it's because all the leaves outside are fading and withering that I have this desire?! Hmm, maybe. But for now it sure feels good to be surrounded by all this green freshness. And to continue this trend I am making myself a cup of green tea now. Have a lovely day! Have I ever told you green was my favourite colour? Followed very closely by orange...Green always gives such a sense of peace and calm, don't you think? Muy bellas imágenes.A mí me invitan al relax.Esos piecitos son una dulzura!Hermosos tonos! Un abrazo. Cute little toes, I love it:) Maybe your desire to green is cause it is fading away. I don't like it as color inside my house but I love it in nature. I notice I try to memorize last sights of nature now when there is something left. this has to be one of the most beautiful post i have seen. thank you for the visit, my friend. Green is my favorite color! 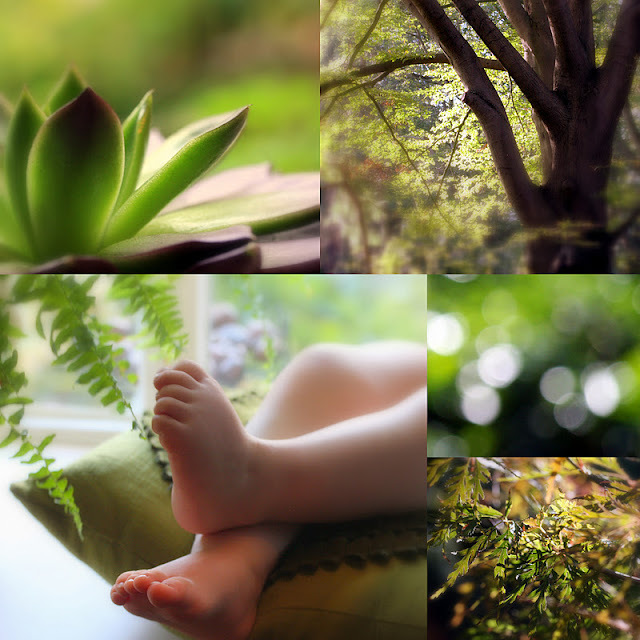 So nice seeing all the lovely shades of green in your photos. And cute toes!